Home / drugs using stem cells / health / stem cell therapy / Stem cell transplants / types of stem cells / what are stem cells / How Does Stem Cell Therapy Work? Stem cells are the body's master cells. They are the body's raw materials, which means that they are the cells that generate all other cells with specialized functions. Under the right conditions, either in the body or a laboratory, these cells divide to form more cells known as daughter cells. The daughter cells either become new stem cells through a self-renewal process or become specialized cells through differentiation with a more specific function, such as blood cells, heart muscle cells, brain cells, or bone cells. 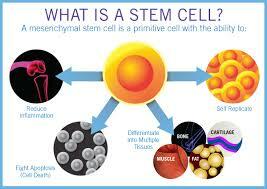 Only the stem cell in the body has the natural ability to generate new cell types. Why Are Stem Cells Gaining Importance? Doctors and researchers think that stem cell studies can help to increase the understanding of how various diseases occur. By letting stem cells mature into cells in bones, nerves, heart muscle, and other organs and tissue, they may better understand how diseases and other medical conditions develop. Further, they believe that stem cells generate healthy cells to replace diseased cells, and this process is known as regenerative medicine. Stem cells can be tailored into becoming specific cells that can be used to repair and regenerate damaged tissues or tissues with diseases in people. 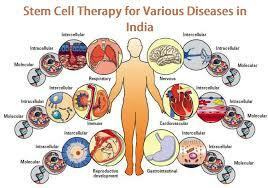 People who will benefit from stem cell therapy in India include those with spinal cord injuries, type 1 diabetes, amyotrophic lateral sclerosis, Parkinson's disease, heart disease, Alzheimer's disease, burns, stroke, cancer, and osteoarthritis. Stem cells might have the potential to be grown to become new tissue for use in transplant and regenerative medicine. Researchers continue to advance the knowledge on them and their applications for the same. Test new drugs using stem cells for safety and effectiveness. Before using investigational drugs in people, biologists can use a few types of stem cells to test the drugs for quality and safety. This type of testing is likely to first have a direct impact on drug development for cardiac toxicity testing. Recent areas of study include the efficacy of using human stem cells that have been tailored into tissue-specific cells to test new drugs. For the testing of new drugs to be practical, the cells must be programmed to possess properties of the type of cells that are targeted by the medicine. For example, nerve cells can be generated to test a new drug for a nerve disease. Tests can show if the new drugs have any effect on the cells and whether the cells are harmed. What Is Stem Cell Therapy (Regenerative Medicine)? How Does It Work? Stem cell therapy, also generally known as regenerative medicine, aids the repair response of diseased, injured or dysfunctional tissues using stem cells or their derivatives. It is the next level in organ transplantation, and it uses cells instead of donor organs, which may be unavailable when needed or are limited in supply. The therapy has proven to be very effective in pain management. They are grown in a lab. They are manipulated to become specific types of cells, such as blood cells, heart muscle cells, or nerve cells. These specialized cells can then be implanted into a person. For instance, if the person has heart disease, the cells can be injected into the heart muscle. The healthy transplanted heart muscle cells will then contribute to repairing the damaged heart muscle. Researchers have already proved that adult bone marrow cells tailored to become heart-like cells can repair heart tissue in people, and the research is continuing. Have Stem Cells Already Proven To Be Effective In Treating Diseases? Yes, doctors have performed stem cell transplants, or commonly referred to as bone marrow transplants. In stem cell transplants, the cells replace damaged cells by chemotherapy or serve as a way for the donor's immune system to fight some types of cancer and blood-related diseases, such as leukemia, neuroblastoma, lymphoma, and multiple myeloma. Stem cell transplants use adult stem cells or umbilical cord blood. Researchers and doctors are testing adult stem cells to treat other conditions, including many degenerative diseases such as heart failure.